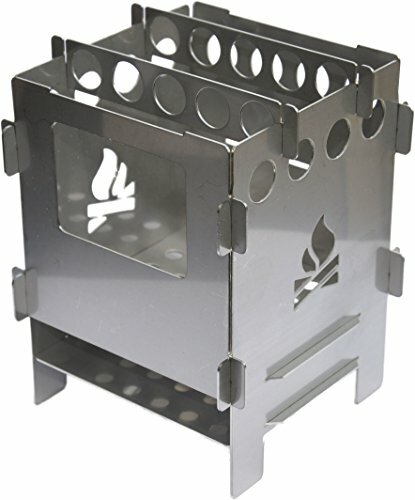 The famous multi-fuel pocket stove, designed and manufactured in Germany. Environmentally friendly, simple configuration allows the Bushbox to be used with wood, other organic material, a standard Trangia burner, Esbit or other fuel tablets. Comes with two trivets for any pot size. Can also be used as a windshield/pot support for other burners. Very small and lightweight, fits into any pocket. Comes with an ash pan for soil protection. 11,5 x 9 x 0,5 cm ; lightweight: 270g, flat pack. Please note that Bushcraft Essentials does not polish their products as to avoid water pollution and health risks. As a result, your new camp stove may show faint scratches. This is normal and does not affect the operation or durability of the stove. Bushcraft Essentials stoves are designed and manufactured in Munich, Germany, to the highest manufacturing specifications possible, and contain no plastics in the products or in the packaging - opting instead for cotton bags and cardboard. Important: Follow the disassembly instructions in the manual! If you have any questions about this product by Bushcraft Essentials, contact us by completing and submitting the form below. If you are looking for a specif part number, please include it with your message.